Nurokind injection contains Methylcobalamine which is a synthetic version of Vitamin B12, essential for growth, cell reproduction, blood formation, and also for protein and tissue synthesis. Vitamin B12 injections are useful in the treatment of Vitamin B12 deficiency in patients suffering from medical conditions such as pernicious anemia. In our online pharmacy, Methylcobalamine injections are available in vials of 500 mcg and 1500 mcg of purified Vitamin B12. We also have in stock Menotrophin (HMG 75 IU and 150 IU Injection) which is used for stimulation of ovulation and pregnancy in women with ovulatory dysfunction not due to primary ovarian failure as well as for stimulation of spermatogenesis in men with primary or secondary hypogonadotropic hypogonadism. Nurokind injections. Other brand names include Berubigen, Betalin 12, Cobavite, Redisol, Rubivite, Ruvite, Vi-twel, Vibisone. 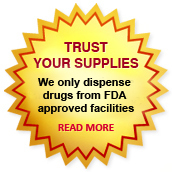 The active pharmaceutical ingredient in Nurokind injections is Methylcobalamine 500 mcg or 1500 mcg . Each vial of Vitamin B12 injection contains 500 mcg or 1500 mcg of purified Methylcobalamine. Methylcobalamine Injection Uses - What is Nurokind Used For? 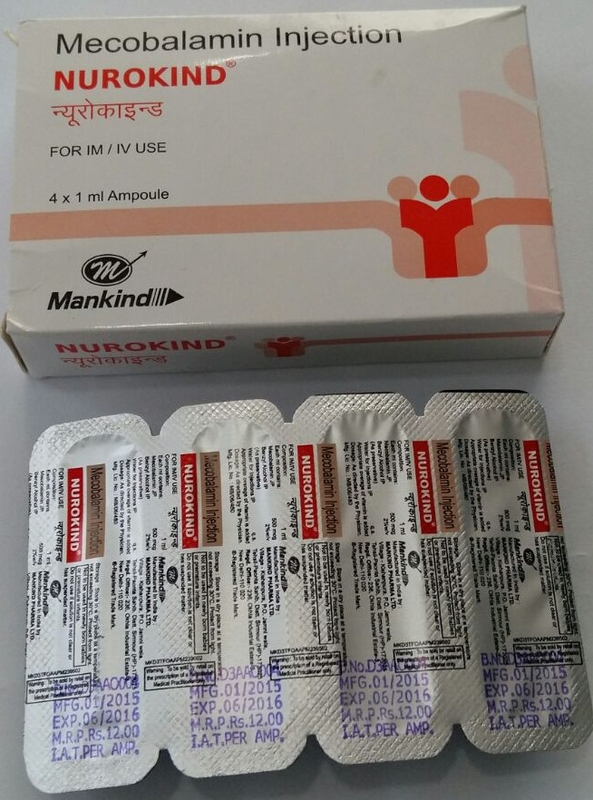 Nurokind injections, manufactured by Mankind Pharma, contain Methylcobalamine which is useful in the treatment of Vitamin B12 deficiency in patients. Vitamin B12 is vital for normal growth conditions, blood cells, synthesis of all epithelial cells and preservation of myelin sheath all through the nervous system. Vitamin B12 deficiency usually occurs due to the defect in the absorption of Vitamin B12 in certain health conditions such as under-nourishment, stomach/intestinal problems, infection, and cancer. Methylcobalamine (Vitamin B12) injections are typically administered as intramuscular/subcutaneous therapy in patients suffering from Addisonian (pernicious) anemia, gastrointestinal pathology, dysfunction, surgery, gluten enteropathy or sprue, small bowel bacteria overgrowth, total or partial gastrectomy. Vitamin B12 injections are also used in medical conditions such as fish tapeworm infestation, cancerous growth in pancreas or bowel, and folic acid deficiency. Vitamin B12 shots (Nurokind 500 mcg) are administered for the treatment of methylmalonic aciduria (an inherited disease in which the body cannot break down protein) and is sometimes administered in unborn fetus to prevent methylmalonic aciduria after birth. Treatment with Vitamin B12 injections can also be appropriately used for the Vitamin B12 absorption test, known as the Schilling test, which examines how well a body absorbs vitamin B12. Vitamin B12 injections are administered right into the bloodstream and can be used to give Vitamin B12 to people who cannot absorb Vitamin B12 through the intestine. Nurokind Dosage - How to Take Methylcobalamine Injections? You should use Vitamin B12 injections exactly as recommended by your doctor. Your doctor may suggest a dosage of Methylcobalamine (Vitamin B12) injections depending on your medical requirement, body weight, other medical conditions, and current medications. Vitamin B12 shots should be taken once a day. Try to maintain a regular schedule for the medication to get the maximum benefit of Vitamin B12 injections. You should replicate the technique of administering the injection exactly as shown by your doctor. The solution to be injected should be a clear solution and should not have any particulate suspension in it. Methylcobalamine (Vitamin B12) injection is administered under the skin or into the muscle. Your doctor may alter the dosage of Vitamin B12 injections and dosage period depending on your response to treatment, or if you become pregnant, breast-feed, or if you are on a vegetarian diet. You may need to monitor your health through frequent blood tests (every 3-6 months) during the course of treatment with Vitamin B12 injections. Patients suffering from pernicious anemia will be administered 100 mcg Methylcobalamine intramuscularly or subcutaneously once daily for 6-7 days, followed by 100 mcg Vitamin B12 on alternate days for seven doses, then every 3-4 days for another 2-3 months. Once the hematological values come back to normal, pernicious anemia patients will have to take 100 mcg Vitamin B12 shots every month for the rest of their lives. The flushing dose required in Schillings test is 100 mcg. Nurokind Mechanism of Action – How Does Methylcobalamine Work? Vitamin B12 is supplied naturally in the average diet. About 5 to 15 mcg/day of vitamin B12 is available for absorption post digestion in the intestine in a protein-bound form. Vitamin B12 is essential for normal growth, cell division, formation of new blood cells, and nucleoprotein and myelin synthesis. Vitamin B12 in the body is commonly stored in the liver. Vitamin B12 also plays an important role in the breakdown or metabolism of fats and carbohydrates and has a role in protein synthesis. Vitamin B12 deficiency may result in anemia, gastrointestinal problems, and nerve damage. Methylcobalamine injections are used to treat pernicious anemia and vitamin B12 deficiency. If you miss your regular dose of Vitamin B12 injections (Nurokind 500 mcg or 1500 mcg ), please consult your doctor for further instructions. Store the vial of Methylcobalamine injections (Nurokind 500 mcg or 1500 mcg ) at room temperature (20 – 25°C) before mixing, protected from heat, moisture, and sunlight. Retain the original packing of the medication and do not administer Methylcobalamine injections (Nurokind 500 mcg) beyond its expiration date. Do not use the vial of Vitamin B12 injections if it contains particles, some discoloration, or if the vial is cracked or damaged. Keep the vial of Vitamin B12 injections away from the reach of children and pets. Do not discard Methylcobalamine (Vitamin B12) injections along with domestic waste or sewage. Consult your doctor or pharmacist about the correct method of disposal. Do not reuse materials such as needles and syringes because they will be contaminated after one use. Before beginning the treatment with Methylcobalamine injections (Nurokind 500 mcg), discuss your personal and family medical history with your doctor. Inform your doctor if you have any type of infection, iron or folic acid deficiency, kidney or liver disease. Let your doctor know if are under bone marrow medications. Please inform your doctor if you have an allergy or have had an allergic reaction in the past to Vitamin B12 or any inactive ingredient in Methylcobalamine injections (Nurokind 500 mcg). Before beginning the oral therapy of Vitamin B12 injections, please inform your doctor of all your current medications including prescription drugs, over the counter medications, mineral supplements, herbal products, and vitamins. Let your doctor know if you are using any antibiotics, drugs that may affect blood cell production (e.g., chloramphenicol, anti-cancer drugs, HIV drugs), methotrexate (Rheumatrex), pyrimethamine (Daraprim), colchicine. The treatment with Vitamin B12 injections is contraindicated in patients who are allergic to Vitamin B12 or any inactive ingredients present in Vitamin B12 injections. Vitamin B12 shots are also contraindicated in patients who are suffering from Leber’s disease because Methylcobalamine can lead to optic nerve damage (and possibly blindness) in such patients. During treatment with Methylcobalamine injections, patients are advised to avoid alcohol consumption. Methylcobalamine is a FDA pregnancy category C medication. Methylcobalamine can be transmitted through breast milk to a nursing baby. Pregnant women and lactating mother are usually advised to consult their doctor if they are planning to become pregnant or start breast feeding during the course of Vitamin B12 injections. If you plan to have surgery or any dental procedure, inform your doctor or dentists about your course of Vitamin B12 injections (Nurokind 500 mcg). In case of an emergency medical treatment, please inform the practitioner about your course of Methylcobalamine injections and the details of your last dose. Cardiovascular System: - chest pain, pulmonary edema, congestive heart failure, peripheral vascular thrombosis, polycythemia vera, arrhythmia. Central Nervous System: - headache, dizziness, confusion. Gastrointestinal System:- nausea, indigestion, diarrhea. Musculoskeletal System:- swelling, pain in arm or leg, numbness, tingly feeling, muscle cramps, joint pain. Respiratory System: - shortness of breath with mild exertion. Hypersensitivity:- fever, redness, irritation at the site of injection, itching, rashes, coughing, wheezing. General:- rapid weight gain, weakness, anaphylactic shock, eczematous skin lesions, hypokalemia, sudden changes in vision, slurred speech, extreme thirst. Inform your doctor immediately if you experience any of these side effects. This is not a comprehensive list of all the possible side effects of Nurokind injections (Methylcobalamine injections 500 mcg). If you develop any other medical conditions during the course of treatment with Vitamin B12 injections, please consult your doctor immediately. You can buy Nurokind 500 mcg and 1500 mcg injections online from Clear Sky Pharmacy. The Vitamin B12 injections are supplied in a box with 4 vials. Each vial of 500 mcg costs only $1.00 when you place an order for 80 vials.